There were 2 big events going on last weekend. 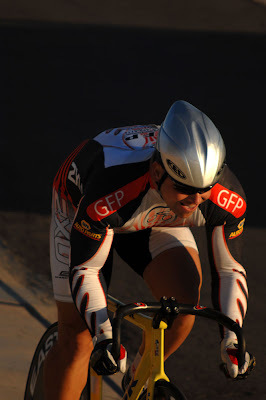 The SoCal Nevada District Elite Track Championships, and th Collegiate National Track Championships. Matt Donovan scored another championship jersey. You might remember he got himself a masters championship in the match sprints in August. Now he can add an Elite state championship jersey to that collection, as he ( along with his 2 teammates) won the team sprint competition. They beat some really high quality teams to do it, so that make the victory that much sweeter. I coach 2 of the riders that went to collegiate track nationals. Julia and Kelcie both set PRs in the 500m and 2000m time trials, while Kelcie also set a PR in the 200m. Julia not only set personal records, but won bronze medals in both the 200m and the 2K. The highlight of the weekend was when Julia and Kelcie won the team sprint with their teammate Anna Lang, so they all get to go home with a national champ jersey.